Après Furniture specialises in contemporary office desks, ranging from single office workstations to adjustable height desks. We offer the very best contemporary office desks as we source from Europe’s leading office furniture manufacturers. Contemporary Office desks have progressed significantly in the last few years in terms of design, functionality and features. You can be sure that whichever decision on contemporary desks you make with Après, we will include the very best of these characteristics such as integrated lockable storage, non-linear, angled, yet practical shapes and even wall mounted options. We are exceptionally proud of our executive desks, designed for high-level corporate office environments requiring functional and ergonomic features with a strong aesthetic. Presenting the right image to clients can make a great impression, and choosing high quality contemporary office desks will help you achieve this. Businesses are also increasingly recognising the need to look after their employees wellbeing, and this is something that our contemporary office desks take into account. We supply height-adjustable desks and sit-stand solutions so that users can change their position throughout the day. Studies have proven that alternating between standing and sitting at work has a positive effect on health and subsequently improves workrate and morale. Adjustable height desks are also ideal for new employees as well providing hotdesking solutions due to their versatility. We probably have the best range of quality contemporary office desks in the UK, following years of experience and knowledge in the office furniture industry. 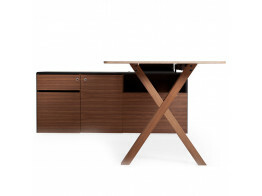 Partita Wooden Office Desk provides a natural warm finish with integrated technology support. Calvino Desks for the office with optional memory return, pedestals and management level desking. Nomado Office Workstations offer mobile hotdesking, lighting, acoustic sound absorption and magnetic whiteboard. 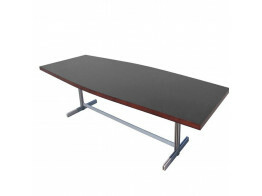 Synapso Office Desk range includes bench desks and meetings tables with cable management. 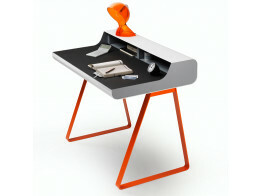 M2 Workstation is an office desk designed to be compact whilst offering unlimited leg room. Cintree Table by Jules Wabbes can be used as an office meeting table, desk or breakout table. 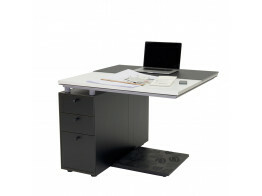 Secretair Privacy Desk on castors is a mobile workstation designed for agile working and hotdesking.